During the AFC and NFC Championship Games yesterday, Warner Bros. debuted two new TV spots for the highly-anticipated Tomb Raider, which hits theaters nationwide on March 16. 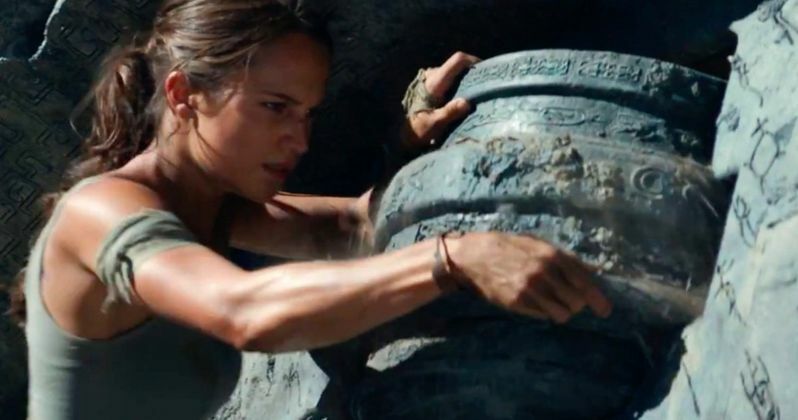 These TV spots showcase the origin adventure undertaken by a young Lara Croft, played by Oscar winner Alicia Vikander, with footage highlighting her meeting with the villain Mathias Vogel (Walton Goggins). He claims to see several distinct qualities of her missing father in Lara herself, such as his intelligence and recklessness. One video also includes a scene where Lara admits that she's not a "superhero," although some of her death-defying actions say otherwise. While this video game franchise has been around since 1996, this movie will be based on the video game reboot that launched in 2013, and followed a much younger Lara Croft as she goes on her first ever adventure, to find her missing father, who has been gone since she was a teenager. This movie picks up with Lara Croft (Alicia Vikander) at the age of 21, described as "fiercely independent" although she lacks focus in life, barely scraping by in East London as a bike courier. She could take over her father's empire, yet she refuses to believe that he's truly gone, even seven years after his disappearance. Ultimately, Lara must face her destiny and find out what ultimately happened to her father. Leaving everything she knows behind, Lara Croft goes in search of her dad's last-known destination: a fabled tomb on a mythical island that might be somewhere off the coast of Japan. But her mission will not be an easy one; just reaching the island will be extremely treacherous. Suddenly, the stakes couldn't be higher for Lara, who, against the odds and armed with only her sharp mind, blind faith and inherently stubborn spirit, must learn to push herself beyond her limits as she journeys into the unknown. If she survives this perilous adventure, it could be the making of her, earning her the name tomb raider. Alicia Vikander leads a cast that also includes Dominic West as Lara Croft's father, Lord Richard Croft, Daniel Wu as Lu Ren, a ship captain who helps Lara on her adventure, Kristin Scott Thomas as Ana Miller, an associate at Lara's father's firm, Croft Holdings, Hannah John-Kamen as Sophie, Lara's flatmate and best friend, plus Derek Jacobi and Nick Frost in unknown roles. Director Roar Uthaug works from a screenplay by Geneva Robertson-Dworet and Alastair Siddons. Graham King produces through his GK Films label, with Patrick McCormick, Denis O'Sullivan, Noah Hughes serving as executive producers. Warner Bros. has set a March 16, 2018 release date for Tomb Raider, which puts it up against 20th Century Fox's coming-of-age drama Love, Simon and an untitled horror movie from A24. It will also come just a week before what could be one of the first blockbusters of the year, Disney's A Wrinkle in Time, which hits theaters on March 9 along with STX Entertainment's Gringo, Entertainment Studios' The Hurricane Heist and Aviron's Strangers: Prey at Night. It will also open one week before Universal's Pacific Rim: Uprising, Open Road Films' Midnight Sun and Bleecker Street's Unsane on March 23. Take a look at this new Tomb Raider TV spots, courtesy of Warner Bros. YouTube.